Over the next three weeks, I’m focusing this blog on issues of inequality. In part, this is prompted by Robert Putnam’s new book, Our Kids, which explores the nature of inequality of opportunity across generations. I’m only into the second chapter, but both the changes to Port Clinton, Ohio (Putnam’s hometown and the focus on chapter one) and the changes in Bend, Oregon (chapter two), easily illustrate the connections between structural changes in economics, education, and housing and the cultural dynamics shaping the life choices of families impacted. As I’ve read essays about Putnam’s argument, they seem to serve as a Rorschach test — illumining the favorite theories of the author. It will doubtless be argued that it does the same for me. I’ve also been reading The Long Shadow, a sociological study of children growing up in Baltimore schools. They have also been impacted by changes in terms of economy, housing, and culture. The students in the study are those left behind after white flight caused many with resources to flee Baltimore for the surrounding counties. The Long Shadow is interesting because it compares the dynamics of lower class whites, lower class blacks, and moderately upper class whites. While the picture is complicated by factors of culture and racism, there are very different patterns when it comes to opportunity. In addition to these sources, it seems that every day brings news of the realities of inequality. The Ferguson report from the Department of Justice illustrates the dynamics of differential enforcement. I’ve got recent data on school achievement and college persistence that illustrates the way education at all levels plays a gatekeeping function. We have recently begun to approach a national consensus that our drug policy has been devastating to urban communities and prison overpopulation. And yet we seem unwilling or unable to recognize inequality in our midst. Perhaps, as Matt Taibbi suggested, it’s as simple as the residential segregation that undergirds our interactions. Because we don’t know people outside our circles, we can cherry pick egregious cases and treat them as if they are indicative of entire groups of people. Or maybe we can’t see it because the possibility of Horatio Alger success is so ingrained in the American psyche. We don’t know how to talk about differential opportunity because that might somehow suggest that people were trapped by their circumstances. Better to believe that anyone who works hard and plays by the rules could get ahead — the bootstrap mentality. As MLK said in one of his final sermons at the National Cathedral, it’s one thing to say a man should pull himself up by his bootstraps but it’s a cruel joke to say that to a man with no shoes. But if there’s one time of the year when we should understand the structural nature of inequality, it’s March. Today, the bracketology came to a head and we know who made it to the dance. Beginning Tuesday, teams begin competing in the NCAA men’s national championship. 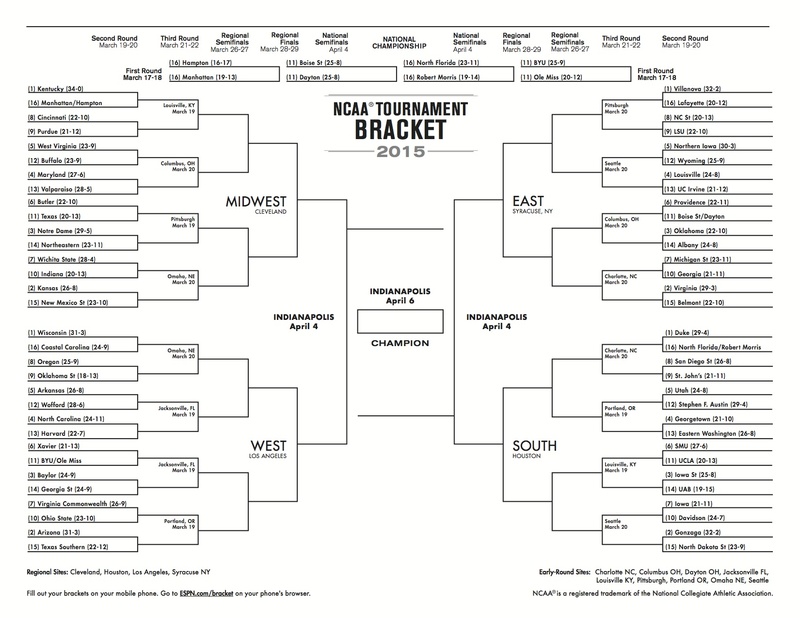 The whole thing centers on the top seeds of Kentucky, Wisconsin, Villanova, and Duke. We watch the tournament and root for “Cinderella teams”, small feisty groups of guys who don’t read the brackets and come from small markets. This is their “one shining moment”. But in the vast majority of the cases, the seeding matters. The strong teams seem to prevail. We like the hustle of the Coastal Carolina team, but eventually Wisconsin will wear them down. Remember too that these 68 teams are but a tiny fraction of NCAA Division One schools. Furthermore, if we look at the top couple of seeds in each bracket we can find teams that are somewhere in that mix every single year. It’s not just that they have a talented team — they have a reputation, a coaching staff, scholarship dollars/boosters, and facilities that help them attract the best players. It doesn’t mean that the number one seeds will be in the final four. They can have an off night or have a key player injured or in foul trouble. But the odds are that the lower seeds will prevail. This is a lesson that is far deeper than what we see Thursday to Sunday over the next three weeks. It happens in the same fashion every day across this country. So I’ll be blogging during the tournament to explore how those dynamics play out. I hope you’ll follow along.